What went largely (entirely) unreported in my recent tuna recipe was another episode of Jeremy Fails Dinner. I didn't quite fail the dinner part, obviously, but I certainly failed the not-being-a-dumbass part of dinner. 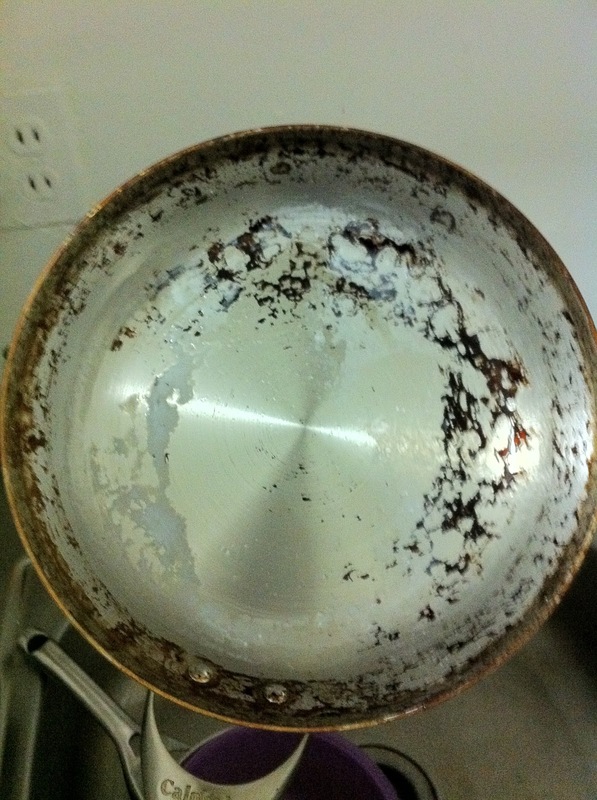 I fear I may have ruined my favourite calphalon frying pan. You know the part of the recipe where I was supposed to boil the potatoes? Well, the pan with the water in it to boil was on the back burner and the pan I'd used earlier in the recipe was on the front burner. So, naturally I turned the front burner on and left for 15 minutes. After that period I returned to a smoking, black pan and, while I've used some urn cleaner to get a lot of gunk off, I'm still left with the encrustulation you see before you. Pro-tip: Remove cookware you don't plan to use again from the stove whenever possible and check which burner you've turned on. Or, y'know, don't leave a heated pot unattended.